This article is about Mario's Yoshi partner from Paper Mario: The Thousand-Year Door. For the character Yoshi from other games, see Yoshi. Not to be confused with Mini Yoshi. Full name (Player's choice), The Great Gonzales Jr.
Mini-Yoshi (known originally as Yoshi, sometimes called Yoshi Kid) is Mario's fourth party member in Paper Mario: The Thousand-Year Door. He is a spunky Yoshi baby and the youngest of Mario's party members (being newborn). His purpose in the overworld is to allow Mario to ride him and move him around much faster and use a Flutter Jump-like ability to cross gaps. In battle, he starts out with Ground Pound and Gulp. If he is powered up, he learns Mini-Egg for Level 2 and learns Stampede for Level 3. Yoshi hatching out of his egg. While Mario, Goombella, Koops and Flurrie are fighting in Glitzville's Glitz Pit, they find that one of the fighting teams, the Armored Harriers, seem to be impervious to any attack they use. At an earlier time, Mario had found a Yoshi Egg bouncing around, being chased by the owner of the Hot Dog Stand, Mr. Hoggle (who had hopes of making a Southern Fried Egg Dog of Tastiness with it). Mario eventually caught it, and Mr. Hoggle allowed him to keep it as most people "don't like to eat things that move". After Mario returns from his problematic battle with the Armored Harriers, the egg hatches into a newborn Yoshi baby who thanks Mario. He then joins Mario (who he knows as Gonzales), who proceeds to name him. The Yoshi can defeat the Armored Harriers by eating them and spitting them at each other. He travels with Mario for the rest of the game. At the end of the adventure, he goes solo at the Glitz Pit, going under the name "The Great Gonzales Jr.", and is stated to be getting close to the title match. In Goombella's letter, the Yoshi challenges the "Great Gonzales" by saying "I could totally take you in the ring now, so bring it!". He is notable for calling Mario "Gonzales" throughout the entire course of Paper Mario: The Thousand-Year Door (in a manner similar to other non-player characters such as Goldbob and his family); his odd familiarity with this name is due to Mario's pseudonym, "Great Gonzales" (upon Grubba and Jolene's insistence) while fighting in the Glitz Pit. By the end of the game, though, the Yoshi would appear to have slowly realized that "Gonzales's" real name was Mario, but he states that Mario will always be Gonzales to him. "Gosh, what a colorful egg! Must be a good one, huh? I mean, look at it jump! But jeepers creepers, I sure wouldn't want to try to eat it... I mean, EWWWWWW! I don't eat moving things. Let's hurry up, grab it, and give it back to Mr. Hoggle." In Super Paper Mario, Yoshi appears as a Catch Card won by winning the Duel of 100 in the Sammer's Kingdom. Francis has a collection of seven Yoshi dolls, each one a different color. Lastly, Yoshi, along with all the other partners from the previous Paper Mario titles appear in a photograph at the Mario Bros.' House during the introduction. The color of Yoshi is determined (and will stay the same for the rest of the game) by the amount of time that passes between the point where its egg joins Mario's party atop the Hot Dog Stand to when Mario eventually meets the newborn dinosaur after running from the Armored Harriers. The egg starts off with a green Yoshi inside with a red mohawk and wearing orange pants with white polka dots, and changes color every few minutes, as shown on the chart below. If more than twenty minutes elapse before the Yoshi hatches, the cycle restarts. These color options serve for aesthetic purposes only. Level 3: 30 This attack does 1 damage. Level 3: 30 The Attack does 1 damage. Card Description: It's Yoshi from the last Paper Mario adventure. This scrappy Yoshi was the only way to travel! Mini-Yoshi GC Paper Mario: The Thousand-Year Door In Paper Mario: The Thousand-Year Door, this young Yoshi first appears as just an egg. After breaking out of his shell, though, the rascal's cheek and ultra-competitive nature run rampant. He's strong for a little lad and can even carry Mario, who he calls Gonzales. There's a funny reason for that, and it's–oh, we've run out of space. Sorry. Note that the player can, as in the English version, name this character anything under a certain space limitation. These names are the default if the field is left blank. Chibi Yosshī Chibi Yoshi; same as Baby Yoshi from Super Mario World. Spanish Yoshito "-ito" is a Spanish diminutive suffix. When attached to a name, it denotes affection. French PtiYoshi Pti is a contraction of "petit", which means "small"
If Mario brings him along to the top of Riddle Tower for the first time. Yoshi is one of two Yoshis that can be seen outside battle in Paper Mario: The Thousand-Year Door; the other one is seen on the Excess Express, as an adult. During the 2nd fight with Doopliss, after defeating Goombella, Koops, and Flurrie, Yoshi will appear, but, no matter what his nickname is, his enemy name is always "Yoshi". The Italian version of Paper Mario: The Thousand-Year Door refers to him specifically as a Miniyoshi, further explaining that Miniyoshis are "Yoshis just hatched from the eggs". 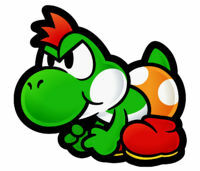 This aligns with the character's Japanese name, which is identical to a Baby Yoshi, along with other localizations and in-game text in the English version referring to him as a "newborn Yoshi baby". The name "Mini-Yoshi" (which is incidentally too large to fit in the original game's text space) was given for his trophy in Super Smash Bros. for Wii U. ↑ Fifth part of Wonky's tale about Miniyoshis in the Italian version of Paper Mario: The Thousand-Year DoorMedia:WYPMTTYD_IT_5.png. ↑ Second part of Wonky's tale about Miniyoshis in the Italian version of Paper Mario: The Thousand-Year DoorMedia:WYPMTTYD_IT_2.png. This page was last edited on April 15, 2019, at 00:22.